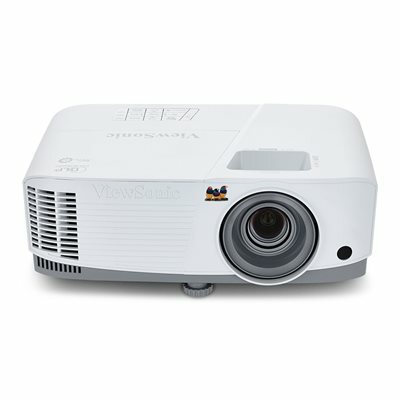 The ViewSonic PA503X projector features 3,600 lumens, native XGA 1024x768 resolution, and intuitive, user-friendly design. Exclusive SuperColor technology offers a wide color gamut for beautiful image production in nearly any environment. With advanced color technology and outstanding sharpness, this feature-rich projector also provides a vast selection of inputs while offering industry-leading durability and dust-resistance. Audiovisual features, flexible connectivity options, and an affordable price makes the PA503X ideal for use in education and small business environments. Convenient design with up to 15,000 lamp hours (SuperEco mode), manual optical zoom and focus, and a muted gray and white finish. Connectivity includes Mini USB Type B, Audio Output (Mini Jack), 3.5mm Audio In, Control (RS232), HDMI 1.4, VGA Out, Composite RCA Video In, RGB Input. XGA (1024x768) 3500 Lumens Projector with 22,000:1 Dynamic Contrast Ratio, Vertical Keystoning and a Screen Size of 85" from 12', or 210" from 30'. Product Dimensions: 4.33"H x 11.57"W x 8.58"D.
Includes PA503X Projector, Power Cable, VGA Cable, Remote Control, Quick Start Guide, ViewSonic Wizard CD. Compatible with Mac, and Windows, can be connected with DVD players, Blu-ray players, Amazon FireTV, AppleTV, Google Chromecast and more. maximum diagonal image size 25 ft in. ViewSonic offers one of the industry's best overall projector warranties with 3-year limited parts and labor, 1-year lamp, and first year free Express Exchange service** for an added value worth up to $150***. **One year Express Exchange Service requires product registration. ***Up to $150 added value over competitive models with 1-year warranty and based on extended warranties from manufacturers and not third party warranty providers.